Fill your space with warmth and smiles, the Center Focus Five is a canvas cluster grouping sure to brighten up your space and bring a smile to all whom see it. This cluster canvas print arrangement is ideal for family photos, and is great if you really like to share your best memories. 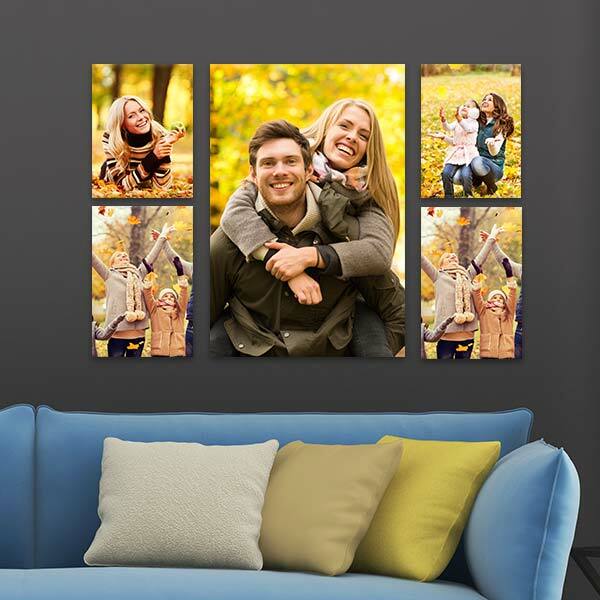 Create a large center focus canvas print to display in your home and on either side of it, add to the memory, or build onto your set of family pictures by adding additional canvas prints for a beautiful, balanced display. For even more options, our Trinity canvas cluster also makes for a stunning photo display on any focal wall in your home. Square Canvas, Panoramic Canvas prints and Small Photo Canvas Print options available.